A Kansas woman is looking to make changes all around the world with a Facebook post gone viral. National news outlets such as BuzzFeed and The Huffington Post have shared the post. Deena Shoemaker of Wichita wants young girls to realize that there is no one-size fits all body – to feel confident in their own skin. It began when Shoemaker was going through her closet and old clothes and found pants that ranged from size five to size 12. She said she tried them all on to see if they fit the same. Shockingly enough, they did. This was something Shoemaker hadn’t realized before. She said it was crazy to put a lot of emphasis on size and the difference. She asked, how are people supposed to feel about it? Shoemaker decided to share her discovery via Facebook. She said she did it so girls would know they are gorgeous now and that pant size doesn’t determine beauty. Girls, she said, should live the way they want; not how people want them to be. Shoemaker had no idea her post went viral until friends sent her text messages saying national news outlets were picking her story up. She only expected friends of her to see it, maybe a few more. 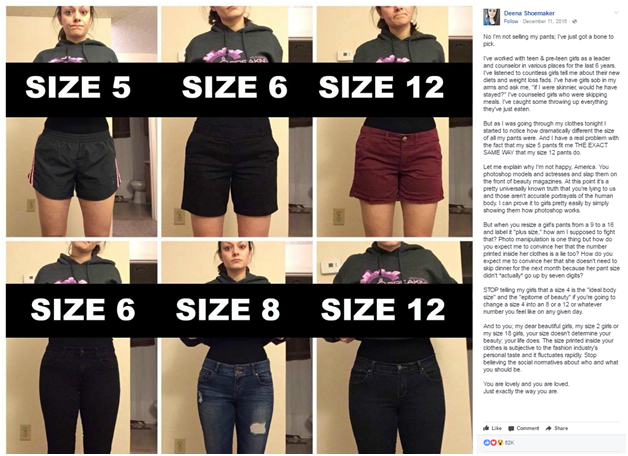 Today, her inbox is loaded with women sharing their stories about their body image as well as the difference her post made. Shoemaker said it was the girls in the youth group where she works that motivated her to share her stories. She was thrilled the message she wrote has touched so many lives and wanted girls to understand they don’t need to let the fashion industry dictate to them what they should or should not look like.